Chennai: Puneri Paltan produced a composed performance in the last 10 minutes to outclass Tamil Thalaivas 33-20 in Inter-Zone Challenge Week of Pro Kabaddi Season 5. It was an evenly fought match for 30 minutes but Deepak Hooda helped Puneri Paltan inflict two all outs to record a comfortable victory. Tamil Thalaivas suffered as Ajay Thakur was kept in check by Puneri Paltan for most of the match. No all-outs were inflicted in the first half. Tamil Thalaivas led 3-1 in the fourth minute but Rajesh Mondal scored with a two-point raid to level the match at 3-3. Tamil Thalaivas scored three straight points in three minutes to lead 6-3 after seven minutes. But Puneri Paltan were back on level terms after nine minutes with the score at 6-6. In the second match of the day, Gujarat Fortunegiants edged past Patna Pirates 30-29. Parvesh Bhainswal and Abozar got high fives for Gujarat as they managed to keep Patna's danger man Pardeep Narwal quiet for most of the match. Narwal scored just five points and had his lowest scoring match of the season. Chandran Ranjit scored seven raid points for Gujarat. Gujarat are now on the top of the table in Zone A with 62 points from 17 matches, while Patna also are top in Zone B with 66 points from 19 matches. It was a low-scoring affair in the first half as both teams were cautious not to make errors. It was 3-3 after five minutes as Gujarat kept Narwal out. Monu Goyat scored two points in two raids as Patna led 5-3. They then got tackle and raid points to lead 7-4 after seven minutes. 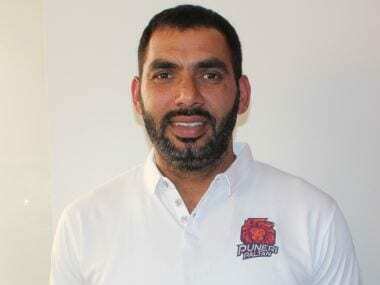 Gujarat however made it 8-9 in the 13th minute as Rohit Gulia scored with a two-point raid, and then they forced a super tackle in the 16th minute as they trailed 10-11. Patna failed to score a point in the last five minutes of the first half as they trailed 11-14 at the break. Narwal scored just two raid points in the first half. Gujarat began the second half brightly as they inflicted an all out in the 23rd minute to lead 18-12. Parvesh Bhainswal got a high five in the 28th minute as Gujarat led 23-13. With Narwal on the bench, Patna were struggling to get points in the board. Chandran Ranjit scored three points with a super raid in the 29th minute as Gujarat led 26-14. The match was slipping from Patna's hands but Narwal got a raid point as they trailed by 10 points after 30 minutes. Patna forced a super tackle in the 33rd minute as they trailed 19-27 and another in the 36th minute to trail 21-28. Jaideep got a high five for Patna as they trailed 24-29 after 36 minutes. 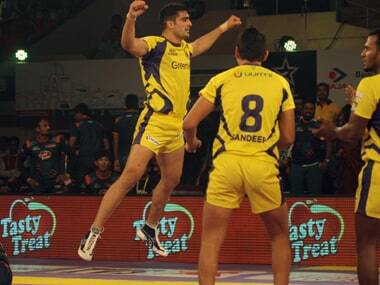 Gujarat's defence did a splendid job on Patna raiders as Abozar got a high five to give his team 30-24 lead. Patna forced their fourth super tackle in the 38th minute to trail 26-30. Narwal got a raid point in the 39th minute as his team trailed by just two points but Gujarat just managed to edge past by a point in the end.